" i won't hurt you, but you might get hurt. the door is here. the key is in your hand. Kondomozo and Ubume are two characters that I invented. They serves as my surrogate self, a synthesis of Korean and Japanese cultures, a metaphor for the meeting of opposites, and the border that separates them. While one may interpret this characters as a reflection of a variety of ideas and aesthetics particular to Asian experiences and identities, Kondomozo and Ubume are primarily a response to the racism I faced as a bi-racial person. I wanted to create a creature who is culturally flexible and who personifies self-acceptance. The universe that Kondomozo and Ubume inhabit is constructed from conscious and subconscious drawings, doodles, text and maps. The palette is inspired by cave paintings. Kondomozo and Ubume's simple shape is repeated and juxtaposed against a chaotic, drawn environment. Kondomozo and Ubume act as a smooth-skinned, nearly-featurless guide, in a wildly unpredictable and marred universe. I find inspiration in the work of several artists and the aesthetics of many cultural movements. 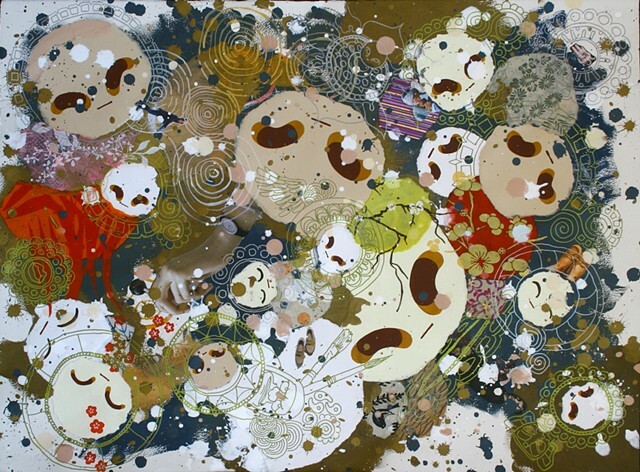 These influences include: Jean-Michel Basquiat; On Kawara; Yoshitomo Nara; Inka Essenhigh; Mark Manders; Laura Owens; Suh Do-ho; Cy Twombly; Julie Mehrets; Andy Warhol; Jackson Pollock; Gustav Klimt; Noh Theater; Japanese YOUKAI story with Natsuhiko Kyougoku works; KOTODAMA; Super Flat-Takashi Murakami; Otaku culture and Mandala painting. I believe that everyone perceives themselvesin some wayas a minority of sorts. It is my hope that Kondomozo and Ubume may act as an ambassador of Other-ness and that people of all backgrounds will feel at home with them, or curious about them.